For as long as I can remember I have been begging, pleading, praying that my parents would let me have a puppy. I had the usual ‘rubbish’ pets growing up. Not that they were rubbish, I’m sure when I was 10 years old I loved Bob the goldfish. However, the goldfish, the several hamsters and the kitten (that died) never came close to the puppy I so desperately longed for. Christmas and birthdays came and went and each year I would convince myself that downstairs there would be a puppy waiting for me. After opening all of my presents I was still convinced it was in the garden. Even once the day was coming to and end I still thought someone was going to come in and shout surprise presenting me with my puppy, my very own little ball of fluff. You see, it wasn’t that my parents were being unfair , or that we wasn’t in the position to get a puppy, it was my sister Lucy. She had been viciously attacked by a Dalmatian in Secondary school. Not only did she HATE dogs, and I literally mean hate. She would never EVER allow for a dog to be present in our house for as long as she was living in it. Moving to uni 3 hours away meant that she would only be back home for holidays and when she had a free timetable. This was the perfect opportunity to persuade my parents. When Lucy was in 2nd year, the puppy mission was still not accomplished. I had wormed my way into Mum, she was already nearly on my side. It was just dad, whatever I tried didn’t work. Begging, sending pictures of cute puppies with messages attached to them, threatening to just buy one. Nothing worked! It wasn’t until I went to visit Lucy and I talked her into getting a puppy that will stay small, such as a Yorkie or a Toy Poodle, she started to come round to the idea. I took her to Pets at Home and let her help me chose puppy supplies. The bed, lead, collar, food bowls and toys. Bringing these back home, I worked on my Dad even more informing him that Lucy had helped me chose. Still nothing. The months leading up to my 21st birthday I made it my mission to get the puppy. I begged, I pleaded, I stated that I wanted nothing more than a puppy for my birthday. My BIG birthday. One that I would remember in years to come. One thing to make it perfect. A beautiful puppy. The morning of my birthday came and there in a pile on the living room floor were my presents. There was no big box, no small cries of a puppy inside, no shuffling inside the box. Nothing! Until… There it was, an envelope. A card inside with a picture of a puppy on, and there it was written in black and white. Written confirmation from my Mum and Dad that I was FINALLY allowed a puppy. MY DREAM HAD COME TRUE. The day I had been waiting for since FOREVER! So I take this time to thank you Mum and Dad for finally caving in after all these years of begging you and driving you insane for letting me have my puppy I have so desperately wanted. 8 months after my 21st birthday, a lot of searching for the perfect pup and dozens of emails backwards and forwards to various sellers, I have my pup. 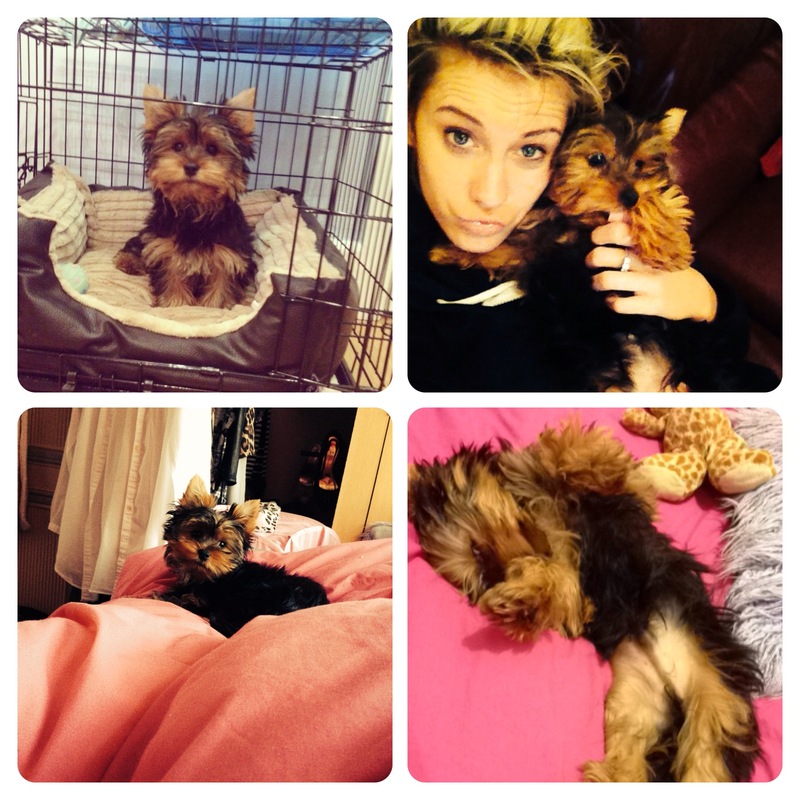 Everyone meet Maximus, a gorgeous 16 week old Yorkshire Terrier, my very own little ball of fluff.